Every once in a while you come across a recipe and go, “I need to make that. And SOON!” That’s what happened when I saw this recipe. The weather was starting to feel good again here in TN, and it was the weekend, so I knew I had time to devote to a yummy meal. The Boy definitely was a fan of these, and I have a feeling I’ll be asked to make them again. Luckily, the recipe makes 4 burgers, so he enjoyed the leftovers. I also halved the mango salsa recipe, and it was plenty. The full recipe is below. In small bowl, combine thyme, salt, garlic, onion, paprika, pepper, allspice, ginger and set aside. Divide ground chicken into four 1/4 lb rounds. Shape rounds into 1/2 inch thick patties (about 5 inches wide). In high sided dish or airtight storage bag, combine soy sauce, vinegar, and brown sugar. Mix to dissolve sugar into liquids. Coat both sides of chicken patties with spice mixture and place into liquid. Seal and place in fridge for about 1 hour to marinate. Turn grill on medium high. 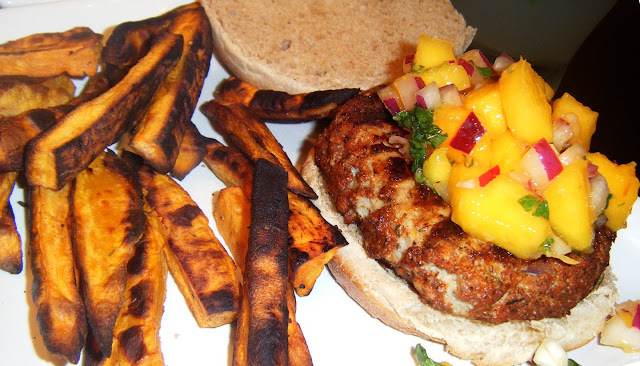 Remove chicken patties from marinade, shake to remove excess and place onto grill. Cook, flipping once, until cooked through, about 15 minutes. Remove from grill and let sit, covered by foil, for 5-10 minutes before serving. Peel and cut mango off of seed. Cut mango sliced into 1/2 inch cubes. In small bowl, combine mango, red onion, cilantro, mint, ginger, lime juice and garlic salt. Mix lightly to combine thoroughly and refrigerate 15min - 1 hour before serving. 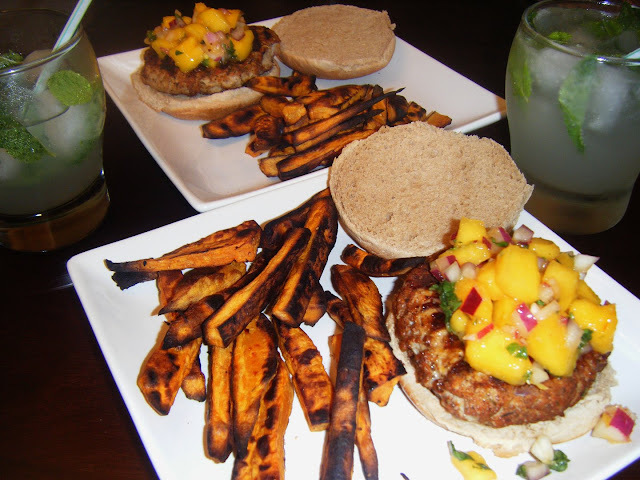 This looks fantastic and I love tropical flavors! These look really great! Perfect for this time of year!